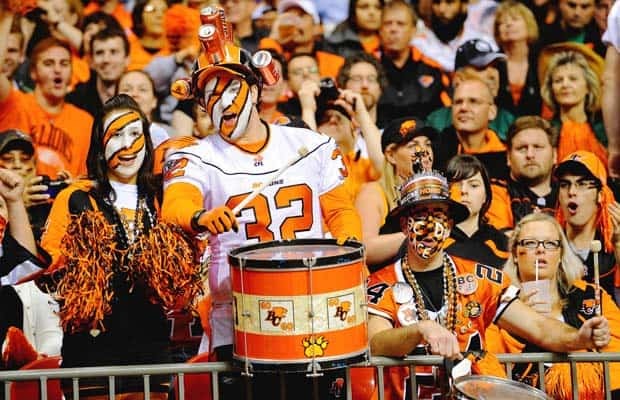 Call it coincidental timing or a shrewdly calculated media release, but the BC Lions posted the results of a survey that suggest the football club is the team of choice for sports fans in the province of British Columbia. With Seahawks fever gripping the lower mainland ahead of this weekend’s Super Bowl, the survey says that football is growing in popularity in BC and that the Lions come out on top. 30% of BC residents surveyed said they are hard-core or regular fans of the Lions, while 21% indicated the Seahawks were their team of choice. Clearly football has a solid following in the province and it continues to grow. 51% of the fans surveyed claimed to be hard-core or regular fans of football, a higher number than the 40% the Canucks garnered, or the Vancouver Whitecaps at 15%. Of course that number includes both CFL and NFL fans, but the fact that football came out on top has to be encouraging for the Lions. The release of the survey results were well timed. The cities of Vancouver and Victoria raised 12th man flags earlier in the day, an honour that to my knowledge as never been bestowed on the Lions or Whitecaps. The city of Surrey also raised a flag in tribute to our NFL neighbours, but at least did so in tandem with a BC Lions flag. Fitting since Surrey is the city the Lions call home for their practice facility. It’s disappointing that these cities would make such a show of support for a team that doesn’t play in our country, our province, or our city. The BC Lions have won six Grey Cup championships for this region, yet they can’t even garner a parade when they bring home the hardware. The last big parade this city saw for a sports team was in 1979, when the Whitecaps won the NASL’s Soccer Bowl. The Lions have hosted two recent Grey Cups, both times bringing massive revenues to the city and its local hotels and businesses, yet they don’t seem to warrant the same support of a team in another country that doesn’t even play here. It’s time to change that. It’s time for our governments to get behind local teams and encourage the support they deserve. The Lions are constantly in the community, and that doesn’t stop in the offseason. There are very few days that players who are in town are not at a function for sick kids, talking on the subject of violence against women, bullying or various other initiatives. The Lions give back to this community in many ways. And this doesn’t apply to just the Lions. The Whitecaps, Vancouver Canadians, Vancouver Giants, Vancouver Stealth all deserve the same treatment. It shouldn’t be reserved for the flavour of the day or a method to get votes, tourism dollars and publicity from rabid Seahawks fans. Of course the Lions have to do their part in terms of marketing to capitalize on this popularity of the sport. Their work in amateur football in this province has been outstanding. The Orange Helmet Awards, the creation of the late Bob Ackles, have raised over $750,000 for amateur football over the 12 year history of the event. But it’s time to take pride in the teams in our own backyard. For what they provide for our communities and our province, it’s the least we can do.